Lowest Possible Intro APR for 18 months on purchases and balance transfers. The periodic rate, expressed as an annual amount, used to compute the interest charge on an outstanding balance. A fee charged once a year for maintaining an account and for any special services. Be sure to check the terms and conditions of the account to see if an annual fee applies. *The category “All Cards” is meant to assist with online credit card browsing purposes only and may not include all credit card products offered by Wells Fargo. Please note that the offers displayed on this page may differ from offers you may have received from Wells Fargo. Please refer to your offer specific disclosures for more details. 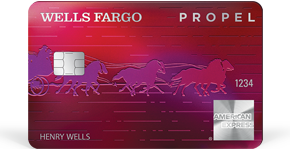 You may not be eligible for introductory annual percentage rates, fees, and/or bonus rewards offers if you opened a Wells Fargo Credit Card within the last 15 months from the date of this application and you received introductory APR(s), fees, and/or bonus rewards offers- even if that account is closed and has a $0 balance. 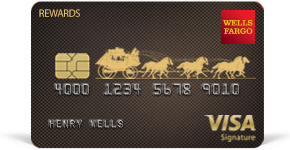 Wells Fargo Secured Credit Card is available to citizens, permanent resident aliens, and nonresident aliens of the U.S.
All other credit cards available only to citizens and permanent resident aliens of the U.S.
Three rewards points (1 base point plus 2 bonus points) are earned per $1 spent on net purchases (purchases minus returns/credits) at retailers whose merchant code for American Express is classified as: Travel: airline, passenger railway, hotel and motel, timeshares, vehicle and auto rentals, cruise lines, travel agencies, discount travel sites, campgrounds, passenger trains, taxis, limousines, ferries, toll bridges and highways, parking lots, and garages. Gas: gas stations and automated fuel dispensers (gas purchases at warehouse and membership clubs, grocery stores, car washes, auto repair stores, and superstores that sell gasoline may not be coded as gas stations or automated fuel dispensers). Dining: eating places and restaurants, drinking places, or fast food restaurants (caterers, bakeries, grocery stores, and other miscellaneous places that serve food or operate restaurants on their premises are not considered eating places and restaurants). Additionally, 3 rewards points (1 base point plus 2 bonus points) are earned per $1 spent on net purchases for eligible online streaming services. The current list of eligible streaming services is available at wellsfargo.com/propelstreaming. Purchases not processed using the codes for American Express mentioned above will not qualify for bonus points. Wells Fargo does not have the ability to control how a retailer chooses to classify their business and, therefore, reserves the right to determine which purchases qualify for bonus points. You may not earn bonus points for purchases made through third-party payment accounts, at online marketplaces, with retailers who submit purchases using a mobile or wireless card reader, or if you use a mobile or digital wallet. One rewards point will be earned per $1 spent on other net purchases. ATM transactions, cash advances of any kind, balance transfers, SUPERCHECKSTM, cash equivalents such as money orders and prepaid gift cards, wire transfers, fees or interest posted to a linked account, including but not limited to returned payment fees, late fees, and monthly or annual fees, do not earn points. Refer to the Summary of the Go Far® Rewards Program Terms and Conditions and Addendum for the Wells Fargo Propel American Express® Card for details. Cellular Telephone Protection can reimburse the eligible Wells Fargo Consumer Credit Card cardholder for damage to or theft of a cell phone. Reimbursement is limited to the repair or replacement of your original cell phone, less a $25 deductible with a maximum benefit limit of $600 per claim and $1,200 per 12-month period. This benefit does not cover cell phones that are lost (i.e. disappear without explanation). This protection is only available when cell phone bills are paid from your Wells Fargo Consumer Credit Card. The coverage does not apply if the cell phone bill is paid from a Wells Fargo Debit Card, Wells Fargo Business Credit Card, Wells Fargo Commercial Card, or from the card that is linked to a Line of Credit. Coverage does not apply to cell phones that are rented, borrowed, or received as part of a prepaid plan. Electronic failure or issues related to the software of the device are not covered. Cellular Telephone Protection coverage begins the first day of the calendar month following your first cell phone billing on your Wells Fargo Consumer Credit Card, and remains in effect when you continue to charge your total monthly cell phone bill to your Wells Fargo Consumer Credit Card. This protection may not be equivalent to or better than other applicable coverage. This is supplemental coverage not otherwise covered by another insurance policy (for example, cell phone insurance programs, or your homeowner’s, renter’s, automobile, or employer’s insurance policies) and may be applied after all other insurance. For complete coverage, benefits, and exclusions regarding this protection, call 1-866-804-4770, 24 hours a day, seven days a week, go to www.wellsfargo.com/ctp. Call your cellular provider (or sign on to their website) and request to set up automatic payments. Setting up automatic payments is not required to qualify for Cellular Telephone Protection; however, you need to pay your monthly cell phone bill with your eligible Wells Fargo Consumer Credit Card to get up to $600 protection. To qualify for the $200 cash rewards bonus, a total of at least $1,000 in net purchases (purchases minus returns/credits) must post to your account within 3 months from the date your account is opened. The bonus cash rewards will show as redeemable within 1-2 billing periods after they are earned. Cash advances and balance transfers do not apply for purposes of this offer and may impact the credit line available for this offer. ATM transactions, cash advances of any kind, balance transfers, SUPERCHECKSTM, cash equivalents such as money orders and prepaid gift cards, casino gaming chips, wire transfers, off-track wagers, lottery tickets, or bets or wagers transmitted over the internet, fees or interest posted to a linked account, including but not limited to returned payment fees, late fees, and monthly or annual fees, do not earn cash rewards. Refer to the Summary of the Go Far® Rewards Program Terms and Conditions and Addendum for the Wells Fargo Cash Wise Visa® Card for details. 1.5% cash rewards are earned for every $1 spent in net purchases (purchases minus returns/credits) on the credit card account. ATM transactions, cash advances of any kind, balance transfers, SUPERCHECKSTM, cash equivalents such as money orders and prepaid gift cards, casino gaming chips, wire transfers, off-track wagers, lottery tickets, or bets or wagers transmitted over the Internet, fees or interest posted to a linked account, including but not limited to returned payment fees, late fees, and monthly or annual fees, do not earn cash rewards. Refer to the Summary of the Go Far® Rewards Program Terms and Conditions and Addendum for the Wells Fargo Cash Wise Visa® Card for further details. 5 rewards points (1 base point plus 4 bonus point (s)) are earned for every $1 spent in net purchases (purchases minus returns/credits) during the first 6 months, from the date the credit card account is opened, at retailers whose merchant code for Visa is classified as grocery stores, drugstores, and gas stations. The maximum amount of bonus points you can earn under this promotion is 50,000 (which is $12,500 in net purchases), regardless of how much you purchase or how many transactions you make during the promotional period. Purchases not processed using these merchant codes for Visa mentioned above will not qualify for bonus rewards points. Wells Fargo does not have the ability to control how a retailer chooses to classify their business and, therefore, reserves the right to determine which purchases qualify for bonus rewards points. You may not earn bonus rewards points for purchases made through third-party payment accounts, at online marketplaces, with retailers who submit purchases using a mobile/wireless card reader, or if you use a mobile or digital wallet. One rewards point will be earned per dollar spent on other net purchases. ATM transactions, cash advances of any kind, balance transfers, SUPERCHECKS™, cash equivalents such as money orders and prepaid gift cards, casino gaming chips, wire transfers, off-track wagers, lottery tickets, or bets or wagers transmitted over the internet, fees or interest posted to a linked account, including but not limited to returned payment fees, late fees, and monthly or annual fees, do not earn points. Refer to the Summary of the Go Far® Rewards Program Terms and Conditions and Addendum to the Go Far® Rewards Program terms and conditions for the Wells Fargo Visa Signature® Card for details. Flights must be redeemed through Go Far® Rewards. For airline ticket redemptions, the number of points required to be redeemed is equivalent to the ticket costs divided by 0.015, rounded up to the nearest whole point. Points comparison is based on Go Far Rewards cash redemption options, where the number of points required to redeem is equivalent to the ticket cost divided by 0.01. Cash redemption options must be redeemed in $25 increments (currently 2,500 points). Certain restrictions and limitations apply. Refer to the Summary of the Go Far® Rewards Program Terms and Conditions and Addendum for the Wells Fargo Visa Signature® Card. 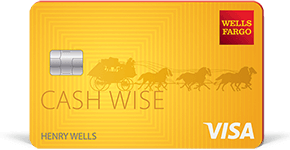 You must be the primary account holder of an eligible Wells Fargo consumer account with a FICO® Score available, and enrolled in Wells Fargo Online® banking. 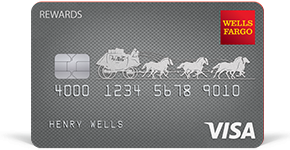 Eligible Wells Fargo consumer accounts include deposit, loan, and credit accounts. Other consumer accounts may also be eligible. Contact Wells Fargo for details. Important: There are many factors that Wells Fargo looks at to determine your credit options; therefore, a specific FICO® Score or Wells Fargo credit rating does not necessarily guarantee a better loan rate, approval of a loan, or an automatic upgrade on a credit card. 5 rewards points (1 base point plus 4 bonus points) are earned for every $1 spent in net purchases (purchases minus returns/credits) during the first 6 months from the date the credit card account is opened at retailers whose merchant code for Visa is classified as grocery stores, drugstores, and gas stations. The maximum amount of bonus points you can earn under this promotion is 50,000 (which is $12,500 in net purchases), regardless of how much you purchase or how many transactions you make during the promotional period. Purchases not processed using these merchant codes for Visa mentioned above will not qualify for bonus rewards points. Wells Fargo does not have the ability to control how a retailer chooses to classify their business and, therefore, reserves the right to determine which purchases qualify for bonus rewards points. You may not earn bonus rewards points for purchases made through third-party payment accounts, at online marketplaces, with retailers who submit purchases using a mobile/wireless card reader, or if you use a mobile or digital wallet. One rewards point will be earned per dollar spent on other net purchases. ATM transactions, cash advances of any kind, balance transfers, SUPERCHECKS™, cash equivalents such as money orders and prepaid gift cards, casino gaming chips, wire transfers, off-track wagers, lottery tickets, or bets or wagers transmitted over the internet, fees or interest posted to a linked account, including but not limited to returned payment fees, late fees, and monthly or annual fees, do not earn points. Refer to the Summary of the Go Far® Rewards Program Terms and Conditions and Addendum to the Go Far® Rewards Program Terms and Conditions for the Wells Fargo Rewards® Card for details. Cellular Telephone Protection can reimburse the eligible Wells Fargo Consumer Credit Card cardholder for damage to or theft of a cell phone. Reimbursement is limited to the repair or replacement of your original cell phone, less a $25 deductible with a maximum benefit limit of $600 per claim and $1,200 per 12 month period. This benefit does not cover cell phones that are lost (i.e. disappear without explanation). This protection is only available when cell phone bills are paid from your Wells Fargo Consumer Credit Card. The coverage does not apply if the cell phone bill is paid from a Wells Fargo Debit Card, Wells Fargo Business Credit Card, Wells Fargo Commercial Card or from the card that is linked to a Line of Credit. Coverage does not apply to cell phones that are rented, borrowed, or received as part of a prepaid plan. Electronic failure or issues related to the software of the device are not covered. Cellular Telephone Protection coverage begins the first day of the calendar month following your first cell phone billing on your Wells Fargo Consumer Credit Card, and remains in effect when you continue to charge your total monthly cell phone bill to your Wells Fargo Consumer Credit Card. This protection may not be equivalent to or better than other applicable coverage. This is supplemental coverage not otherwise covered by another insurance policy (for example, cell phone insurance programs, or your homeowner’s, renter’s, automobile, or employer’s insurance policies) and may be applied after all other insurance. For complete coverage benefits and exclusions regarding this protection go to www.wellsfargo.com/ctp. Cellular Telephone Protection can reimburse the eligible Wells Fargo Consumer Credit Card cardholder for damage to or theft of a cell phone. Reimbursement is limited to the repair or replacement of your original cell phone, less a $25 deductible with a maximum benefit limit of $600 per claim and $1,200 per 12 month period. This benefit does not cover cell phones that are lost (i.e. disappear without explanation). This protection is only available when cell phone bills are paid from your Wells Fargo Consumer Credit Card. The coverage does not apply if the cell phone bill is paid from a Wells Fargo Debit Card, Wells Fargo Business Credit Card, Wells Fargo Commercial Card or from the card that is linked to a Line of Credit. Coverage does not apply to cell phones that are rented, borrowed, or received as part of a prepaid plan. Electronic failure or issues related to the software of the device are not covered. Cellular Telephone Protection coverage begins the first day of the calendar month following your first cell phone billing on your Wells Fargo Consumer Credit Card, and remains in effect when you continue to charge your total monthly cell phone bill to your Wells Fargo Consumer Credit Card. This protection may not be equivalent to or better than other applicable coverage. This is supplemental coverage not otherwise covered by another insurance policy (for example, cell phone insurance programs, or your home owner’s, renter’s, automobile, or employer’s insurance policies) and may be applied after all other insurance. For complete coverage benefits and exclusions regarding this protection go to www.wellsfargo.com/ctp. To qualify for the Wells Fargo Cash Back CollegeSM Card, students must be the age of majority or emancipation in the state of residence; and meet other credit qualifications. Applicants must be able to demonstrate the ability to individually repay their debt. Students with an established credit history may also consider the potential advantages of applying for other Wells Fargo Credit Card products. 3% cash rewards (1% base plus 2% bonus) are earned for every $1 spent in net purchases (purchases minus returns/credits) during the first 6 months, from the date the credit card account is opened, at retailers whose merchant code for Visa is classified as grocery stores, drugstores, and gas stations. Purchases not processed using these merchant codes for Visa mentioned above will not qualify for bonus cash rewards. Wells Fargo does not have the ability to control how a retailer chooses to classify their business and, therefore, reserves the right to determine which purchases qualify for bonus cash rewards. You may not earn bonus cash rewards for purchases made through third-party payment accounts, at online marketplaces, with retailers who submit purchases using a mobile/wireless card reader, or if you use a mobile or digital wallet. A 1% cash reward will be earned per $1 spent on other net purchases. ATM transactions, cash advances of any kind, balance transfers, SUPERCHECKS™, cash equivalents such as money orders and prepaid gift cards, casino gaming chips, wire transfers, off-track wagers, lottery tickets, or bets or wagers transmitted over the internet, fees or interest posted to a linked account, including but not limited to returned payment fees, late fees, and monthly or annual fees, do not earn cash rewards. Refer to the Summary of the Go Far® Rewards Program Terms and Conditions and Addendum to the Go Far® Rewards Program Terms and Conditions for the Wells Fargo Cash Back CollegeSM Card for details. If your application is approved, in addition to the terms and conditions of the credit card, you must also make a one-time security deposit of $300-$10,000 to a Wells Fargo deposit account called a "Secured Card Collateral Account." If you do not have the full security deposit amount, but you do have at least $300 in your funding account, you agree that Wells Fargo can immediately transfer $300 to your Secured Card Collateral Account. Your security deposit determines the limit that you may charge up to, and is held as a deposit in the Collateral Account. The Secured Card Collateral Account will be opened in your name and is a non-interest bearing account, therefore no interest will be paid to you on the Collateral Account. You still need to make monthly payments toward any balance you accrue, as with any other credit card. 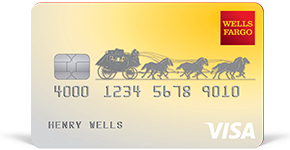 Review the Wells Fargo Secured Credit Card Terms and Conditions for details. Deposit products offered by Wells Fargo Bank, N.A. Member FDIC. Eligibility to upgrade to an unsecured credit card is subject to credit qualification and is restricted to U.S. citizens and permanent resident aliens with a valid Social Security Number or Individual Taxpayer Identification Number. Eligibility is limited to citizens and permanent resident aliens of the U.S with a valid Social Security Number. A valid Social Security Number is a Social Security Number without restrictions. Nonresident aliens may want to consider applying for the Wells Fargo Secured Credit Card instead.